Police released descriptions and surveillance footage Thursday of two men who allegedly stabbed a San Jose State University football player early Sunday morning in downtown San Jose. The stabbing was reported around 1 a.m. Sunday at Post and South First streets. 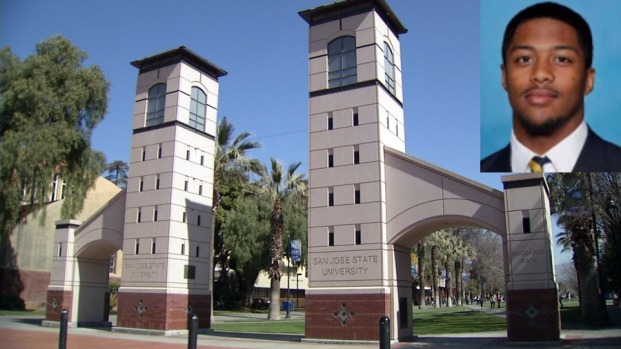 The victim, identified by SJSU officials as Vallejo native Chad Miller, was taken to a hospital. The junior safety and communications major was expected to recover as of Monday, but hospital officials did not immediately return a request for his updated condition Thursday evening. According to investigators, a Hispanic man in his 20s brandished a knife at Miller during an argument. A fight then broke out between two groups of people, police said. Between 15 and 20 people were involved in the fight. A short, heavyset man described as either Asian or Hispanic stabbed Miller with a knife during the fight, police said. The man who stabbed Miller was described as being between 21 and 28 years old and standing 5 feet, 6 inches tall. He appears to weigh about 175 pounds, and to have tattoos on both arms. The stabbing suspect had a mustache, beard and ponytail or Mongolian hairstyle and was wearing an oversized white shirt, black beanie, dark jeans and white shoes. The brandishing suspect had hair that was long on top and shaved on the sides and wore a gray snapback hat with a black bill. He was wearing a white oversized shirt, dark pants and black shoes and appeared to have tattoos on both arms, police said. Anyone with information about the stabbing has been asked to call San Jose police Detective Emilio Perez at (408) 537-1352.